TRAVERSE CITY, Mich., Dec. 4, 2017 /PRNewswire/ -- In the competitive field of event marketing, coming up with fresh new ideas to engage with your customers is imperative. Mass media is everywhere, but some creative manufacturers are now going beyond the 2D standard by introducing foam sculptures to their list of capabilities. The integration of Expanded Polystyrene Foam (EPS) structures have added depth and visual interest at experiential events in the form of life-sized props that engage the public audience. It's a new form of advertising that's incredibly exciting for fans and attendees, perfect for photo opportunities and viral shares on social media. Now, advances in CNC carving technology means that it's no longer necessary to cut foam by hand. New techniques include 3D laser scanning, multifaceted foam routing, and automated hot wire cutting that allows you to transform ideas, drawings, photos, or digital files into foam replicas of any size or detail. If you want your design to be larger than life, you can have it machined into multiple sections and pieced together like a puzzle. Lastly, your finished product can be sanded to a fine finish and a protective Polyeura coating can be applied for durability and corrosion resistance. The 3D foam market has been an essential component in traditional manufacturing, but has now become the standard in industries such as architecture, film and television, theme parks, sports and entertainment venues, and event marketing. Embracing this opportunity, one creative production house has recently added Foam3D™ to their lineup of large format printing and specialty fabrication. "Investing in this technology was the next logical step for us," said Paul Britten, CEO of Britten. "Foam3D™ joins our roster of diverse in-house capabilities, including fabric and mesh banners, tension frames, pop-up stores with BoxPop™, EventTruss™ structures, as well as custom woodworking and metal fabrication. We can produce virtually any custom display right here in Traverse City, Michigan." Once Foam3D™ was launched in July of 2017, Britten began receiving NFL pregame requests from Activate, Inc., an event marketing company in Ferndale, MI. Projects included sets of oversized letters for fan engagement, huge Pepsi cans that were wheeled onto Detroit's Ford Field during halftime for a football toss, and a 25' entrance structure for the Denver Broncos that combined truss and pyrotechnics. For further information about Foam3D™, please visit https://britteninc.com/foam3d or call Britten toll-free at (888) 863-8201. 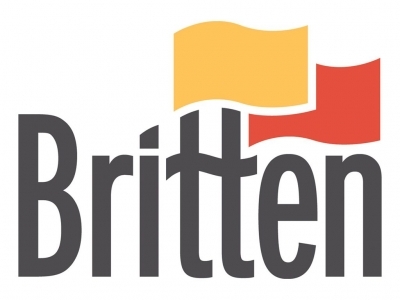 For over 30 years, Britten has been helping some of the world's largest brands visually connect with their audience through high-quality printing and custom fabrication. From events to retail and hardware to print, Britten makes sure your brand is engaging and getting noticed. Britten believes in making it easier for your brand to tell your story, wherever your audience may be.